Grasscycling is a simple, natural approach to lawn care. Grass clippings are 75% to 85% water. 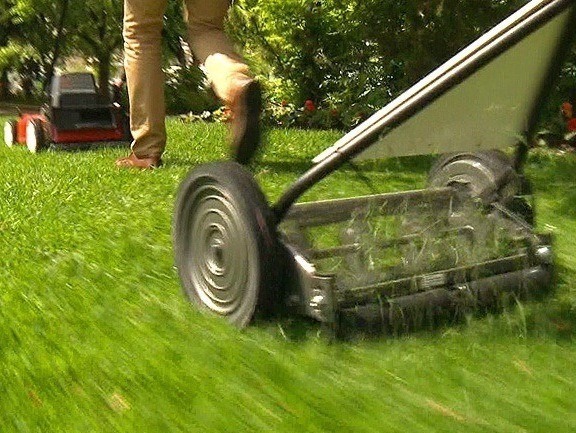 When you mow the lawn and grasscycle, clippings quickly decompose and release nutrients to fertilize the lawn. Proper mowing, watering, and fertilizing of a lawn results in moderate turf growth, yet still produces a healthy green lawn. Grasscycling helps reduce fertilizer and water usage, which can protect local streams, rivers, and the ocean from pollution, since runoff from yards and gardens can contain fertilizers and pesticides. Also, since you do not have to bag your clippings, mowing time is reduced. California lawns can generate 300 to 400 lbs of grass clippings per 1000 square feet annually depending on turf variety, ambient conditions, and lawn care practices. This can amount to over eight tons per acre per year! Grasscycling reduces yardwaste going to landfills by reusing this valuable, rich material right in your own backyard! Here is a Fact Sheet.